1) Five point high security multipoint locking, consisting of four omni-directional mushroom bolts, and a heavy duty hook lock. 2) Key Locking Handles - can upgrade to a Snap-Secure Locking cylinder for added security. 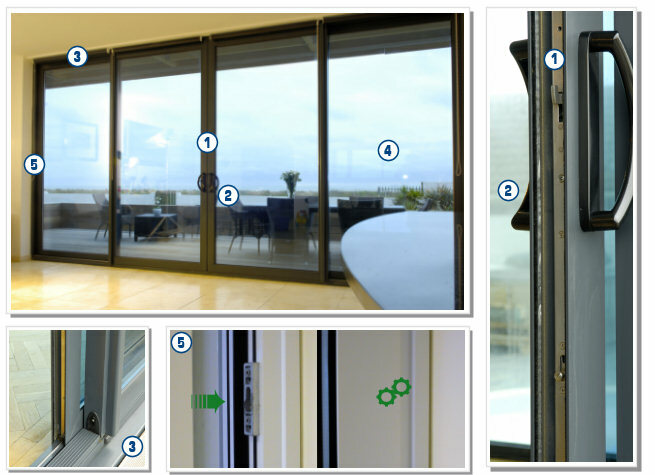 4) Internally glassed sealed units for added security - can upgrade to laminated glass for added security. 5) Sliding sashes wrap the frames, concealing the keeps and locking points (making the locking mechanism impervious to attackers).